In the quest of identifying an easy-to-use test automation tool, QATestingTools ended up in conversation with the TestingWhiz team to learn and explore its range of capabilities. QATestingTools is a leading provider of reviews and analytical materials on testing tools and test management solutions. 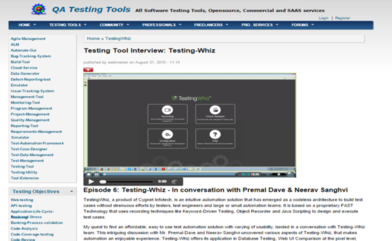 As QATestingTools sat down in an intriguing discussion with Mr. Premal Dave and Nirav Sanghvi – from TestingWhiz, to uncover the various aspects of what makes TestingWhiz different from other test automation tools in the market and how it makes test automation an enjoyable experience. “TestingWhiz is a codeless test automation tool, which is based on a proprietary FAST Technology. It uses easy recording techniques in conjunction with keyword-driven and data-driven testing to automate and execute test cases without involving acute scripting. Even a novice tester with zero programming skills can be up and ready with TestingWhiz in a week’s time,” said Mr. Premal Dave. The interview of TestingWhiz with QATestingTools has thrown light on how promising it is for independent test engineers as well as large QA enterprises to achieve effective test automation goals.